Elements of graphic design can be found everywhere. What better way to teach the students about all the elements of graphic design than by making themselves into what, I hope, gives them the copious energy they have every Saturday morning; a cereal box. The purpose of this project was to advertise each student in a complete styling. The students didn't necessarily have to be a cereal product, but some students did get creative by adding many aspects of them as a real cereal brand. The cereal box was split up with each session focusing on a different part, and mastering the same tools that could be applied to the entire cereal box. On this side, the students created digitized self-portraits of themselves. The main tool used for this was the pen tool, a very useful but challenging tool. The students learned very quickly that, while frustrating, this tool can create great, detailed artistry. Starting with a picture of themselves, the students essentially traced over the picture to recreate the image. Still, they would tell you that it is not as easy as it seems. The pen tool requires a keen eye, an understanding of anchor points of curvature of a line, and the use of layers. After practicing this tool several times, the students were able to tame it and create digitized versions of themselves that looked great. 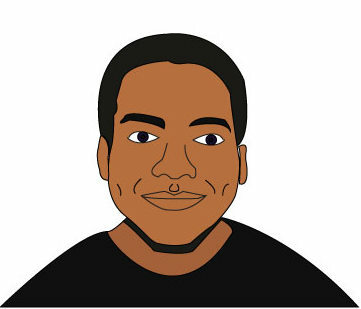 This is a picture of a student, as a final digitized image. In this section, the students created a typographical map of their neighborhood and nearby areas. This section again focused on the pen tool but introduced new elements such as a "clipping mask" and "type to path" tool. The students really developed their pen tool skills in this section. In order to make a typographical map, the students would outline the shapes present in the image of their neighborhood. Then, they would use a new layer to write text of the area they were covering up, i.e. parks and street names. Then, selecting both layers, they would create a clipping mask that would cut the text to the shape they outlined and color it as the shape was colored. The students repeated this for each section of their map. 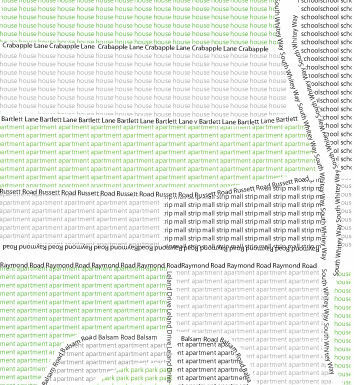 This is a map of a student's neighborhood entirely made up of text. After giving the students a very structured front and back of their cereal box, they were given more freedom for the rest of the box. Keeping in mind that they were creating a cereal box, many of the students created "nutritional facts," based on what makes them who they are. They also started to think of images that could portray aspects of importance to them, such as religion, school spirit, and other things of interest. These are the side panels for another student's cereal box. She chose to draw her journey at ITA on one side of her cereal box. For the final result of the cereal box, the students were asked to think about color schemes throughout the box and overall presentation. They are portraying themselves and need to think about what makes something aesthetically pleasing. The majority of students still have some tweaking to do, in order to make their boxes as presentable as possible. In using a website known as "dropbox" the students are able to work on their projects at home and can send us a complete cereal box that they put time into and would be proud to show. The students came a long way and have begun to understand what it takes to make a complete piece of work/art. This is a great structure for the projects to come in their ITA career.